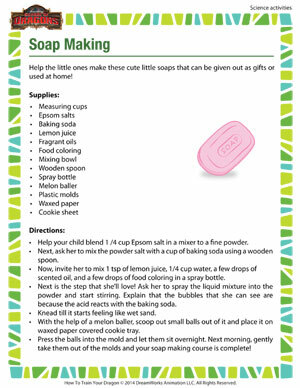 Mix baking soda, citric acid, and other non-toxic, harmless ingredients to make bubbling soaps that can be given out as gifts or stored at home for use. Wrap them in pretty cellophane papers and tie them with satin ribbons and make wonderful Thanksgiving presents out of them or keep them in your child’s bathroom for a nice shower! Have fun with the science activity.